Welcome to the Blackbourne Team website. Please click through the menu to find out more information about the team and the parishes in it including what's happening and how to contact us. United in one Team Ministry since 1992, we are a group of eight diverse, rural parishes working collaboratively across 13 villages which lie in beautiful countryside north-east of the attractive market town of Bury St Edmunds. 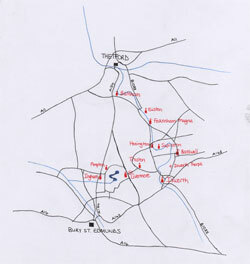 The villages form a reasonably compact cluster; the furthest points of the benefice are about 20 minutes apart by car. They are mostly rural, the exception being Ixworth, already a dormitory suburb of Bury St Edmunds and scheduled for enlargement, with new estates giving opportunities for evangelism. The Team takes its name from the Blackbourne River, which rises near Ixworth and crosses into Norfolk from the parish of Euston, there to be swallowed into the Little Ouse. Each parish has its own tradition of worship and services and its own particular needs but we are a supportive and prayerful community with many activities being run by the lay people from the congregations – these range from informal all-age services, Open the Book and Messy Church to coffee mornings, soup lunches and community cafes and include study groups and prayer groups. We are in the Ixworth Deanery of the Diocese of St Edmundsbury and Ipswich. to equip people to worship and serve God in the whole of their lives and to grow deeper in their faith. 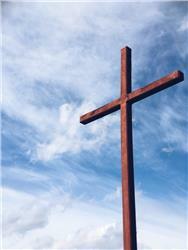 For more information on each of our parishes, have a look at the "our parishes" page. For more information on our church buildings, all of which are listed, please see the "our church buildings" page.